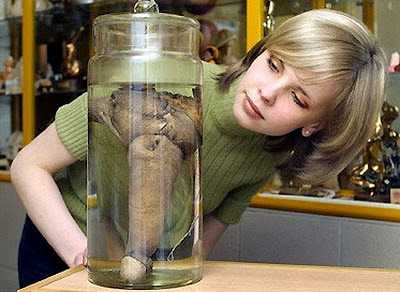 PERO ESTE NO ES EL HOMBRE CON EL PENE MAS GRANDE DE LA HISTORIA ,HASTA AHORA LA PERSONA CON EL PENE MAS GRANDE DE LA HISTORIA FUE RASPUTIN "EL MONJE LOCO " .DE QUIEN SE DICE QUE SU PENE ERGUIDO MEDIA 42 CENTÍMETROS. AUN SE CONSERVA EN UN MUSEO EN SAN PETESBURGO "RUSIA" EN UN BOLLÓN CON FORMOL AUNQUE SE DICE QUE NO ESTA EN SU TOTALIDAD YA QUE AL MOMENTO DE ESTIRPARLO UN PERRO SE QUISO APODERAR DE EL Y NO LO SOLTÓ HASTA QUE LE ARRANCO UNOS 4 CENTÍMETROS. ACÁ VEMOS A UNA CHICA MUY COMPLACIDA CON LO QUE VE. RECORDEMOS QUE LOS 42 CENTÍMETROS ERA ERGUIDO Y QUE SEGÚN SE DICE LE FALTAN 4.